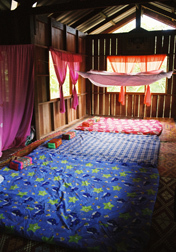 Staying with a host family allows you to take a privileged look into their lives and really connect with the villagers, and you will be made to feel like a member of the family. A translator will be with you during your village stay to allow you to really engage with the villagers on a mutual level. The homestays are simple and comfortable, and managed by the villagers on a rotation system to ensure that it is fair for all families. The houses are as different as the families who live in them, ranging from traditional wooden Thai style houses to tsunami housing. Andaman Discoveries follows the queuing system at the request of the villagers. Alternatively, For those of you who want the in-village experience, but are uncertain about staying with a host family, some villages have houses that are free for people to stay in by themselves. Also, there are a number of accommodation options available in the region to meet any budget, which Andaman Discoveries is happy to arrange. 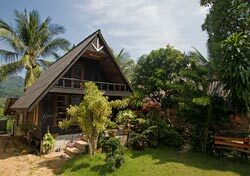 Along with your village homestay, various activities ranging from ecotours to cultural and handicraft workshops are available, allowing you to do as much- or as little- as you’re in the mood for. Kayaking, Batik painting, mangrove exploration, weaving, fishing, and Thai dessert cooking are some typical village activities you can expect to enjoy! This kind of genuine authenticity can not be replicated in a hotel or guesthouse, and is often the highlight of an Andaman Discoveries village tour. While in-village, one of the highlights has to be the food. 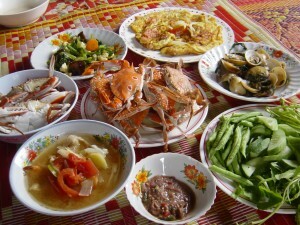 Every meal is a veritable feast of delightfully tasty Southern curries and fresh vegetable dishes. Mouthwatering dishes are prepared using traditional cooking methods with the finest local ingredients and freshly caught seafood. You are always welcome to join in the preparation of the meal and learn come Thai cooking in a traditional setting — a great way to learn the secrets of mouthwatering Thai cuisine.